Call me silly but thinking about these kind of things makes me happy. So, I'm extremely lucky to have a fireplace. We moved here for Dan's doctorate program almost two years ago. I really can't believe we have lived here that long. I digress, we moved into this duplex sight unseen. Honestly, we got pretty lucky. Well, we have a fireplace, but I don't like it. I grew up in a home that had three rooms with similar fireplaces. They were always in my way and I'm not big on brick fireplaces anyway. I dream of one day having a small fireplace. 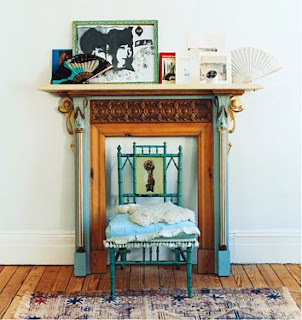 I may even be okay with not having a fireplace and making do like Blonde Redhead did in their apartment. Dominoe did a feature on them way back and it was my favorite Dominoe story ever. I also thought this fireplace was beautiful. Jennifer over at Naughty Secretary Club found it. It kind of reminds me of a quilt from Anthropologie that Buffy had in High School. Love it. Thanks Dominoe Magazine. 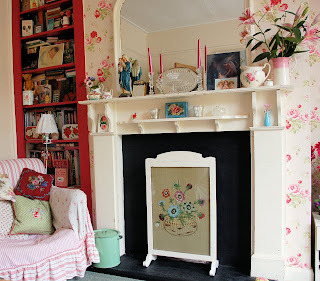 Jane over at Posy has a beautiful fireplace. I love that it looks like it's in an old farmhouse. I hope we all get the fireplace mantle's of our daydreams someday. Those mantles are gorgeous! I hope I get a fireplace when we buy a home. You didn't include a picture of your mantle now. That would be fun to see. Amy, mine is the last one. The brick monstrosity. I hope you get one in your new house too. I love the second one. It does look like that quilt I had. I wonder what happened to it. 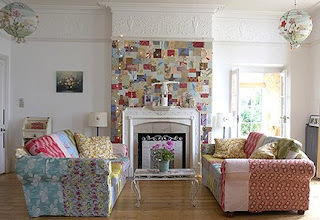 Some of these are surprisingly Shabby Chic for you. I think the first one looks most you.